Brushed Metallic Menu Covers feature material that simulates a rich metallic look and come in six shimmering colors for an upscale, elegant presentation. Interiors are made of black silk moire material with matching album style corners to hold your menu inserts. Brushed Metallic Menu Covers are available with up to six views in five popular sizes so you can create a coordinating menu cover ensemble including dinner, wine, and dessert. Click on any diagram below for standard sizes and pricing. Quantity discounts available on all configurations. Brushed Metallic Menu Covers can also be customized with your logo. 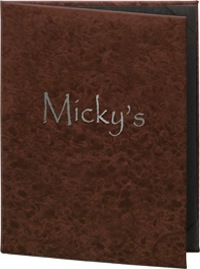 Holds four menu inserts priced from $41.95.